What does an isolated location, an orphanage, self-playing record players, demons, demented children, dark wells, face masks, Catholic priests and scary dolls all have in common? They are all common horror movie tropes… and they are all in this movie, together… at the same time. I feel like Director David F. Sandberg was just like, “Let’s take every horror movie idea, throw them all together and just see what happens.” The answer is a fun horror movie that isn’t the best horror you will see this year, but it is certainly worth your attention. In fact, it’s good enough to almost make you forget about the first film and the fact that you are watching a movie about a demented doll. Which is no easy feat. It’s 1950-something and dollmaker Samuel Mullins and his wife, Esther, tragically lose their child in an accident. Years later they decide to open their home up the a nun and several orphans. Janice, who has partially lost the use of her legs to polio, is immediately “chosen” by the spirit residing in the evil doll and it doesn’t take any time before things start to go downhill. Janice is played by Talitha Bateman and she is really a superb actress. To talk too much about her performance would give away too much of the movie plot, so let’s just say I was impressed. Sandberg has an eye for horror that is quite impressive. Extreme detail was given to the lighting, the set design and even the clothing worn. This is a beautiful movie to look at. From the little crosses in the glass doors of the home to the small nooks and hideaways conveniently set throughout the house, the film’s set design does not disappoint. The shots that take place in the surrounding fields around the home are breathtaking. Annabelle: Creation does a good job of not playing up the whole doll aspect. So, you are never watching “a girl doll version of Chucky.” In fact, the tone is closer to The Exorcist than to Chucky. The film doesn’t hide the demon so much this time around, and it is genuinely terrifying. That isn’t to say that this film isn’t cheesy many times, because it is. I have no idea how no one ever hears the vast majority of screaming and stomping around that goes on in that house. Oh, and there is a whole bunch of “Why did you go into THAT room?” Why are you picking up that thing? Why, for goodness sake, did you do THAT?” After a while, though, this becomes part of the film’s charm. Once the disturbance starts to happen, the film does not give you a break from action. So, yes, the film is very, very cliche in many ways, but somehow it all works. Sandberg managed to create this very creepy film… while at the same time giving a little nod to ridiculous played-out horror film tropes. All of this and then there is the ending, which somehow expertly tied this film to the previous and far less enjoyable Annabelle film. I was seriously impressed at how well writer Gary Dauberman was able to somehow connect the two movies. Anabelle: Creation offers a much better origin story than the original did, without erasing anything from the first film and opening up for more movies and spin-offs. Annabelle: Creation is a fun horror film that is far better than the original. It’s a film full of creepy, cheesy goodness. 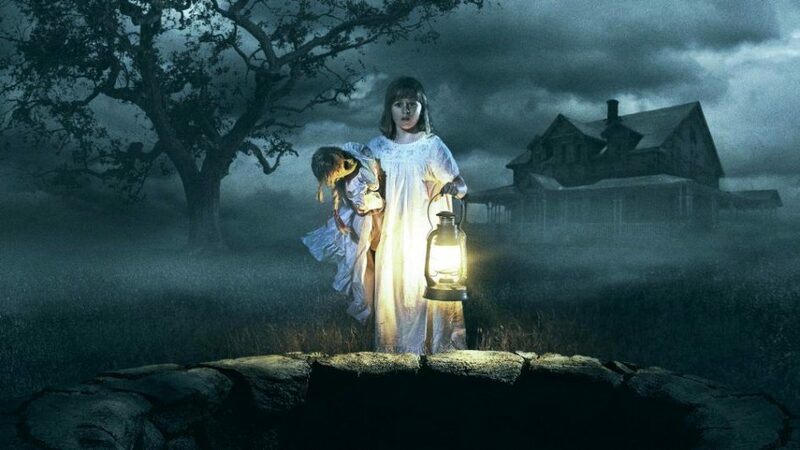 For the horror fan, Anabelle is a must-see addition to The Conjuring Universe. I give the film four stars for superb set design and helpless wide-eyed orphans, whose demise pulls at your heart strings.